South African Airways introduced the ban on transporting hunting trophies in April after being fined for a trophy shipment that made its way to Australia under the label "mechanical equipment"
Animal welfare activists on Thursday decried a decision by South Africa's national air carrier to reverse a ban on the transportation of hunting trophies. 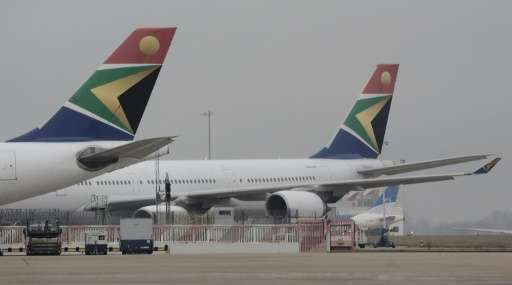 South African Airways introduced the ban in April after being fined by the local aviation authority for a trophy shipment that made its way to Australia under the label "mechanical equipment". But the airline said Wednesday it was satisfied with new compliance measures and lifted the ban—a move welcomed by professional hunters, but slammed by the International Fund for Animal Welfare (IFAW). "SAA has gone from being bold to being bullied in three short months," IFAW Southern Africa director Jason Bell said in a statement. He said the carrier had given in to pressure "at a time when rhino poaching is completely out of control and the (environment ministry) is simply not making any headway in stopping it." South Africa has been battling a boom in rhino poaching since 2007. "It's disappointing that SAA has broken ranks with forward thinking world airlines... who have committed themselves to stopping illegal trafficking by not transporting trophies," Bell said. The SAA embargo had applied to rhino, elephant, lion and tiger trophies. But the environment minister said the ban had failed to distinguish between legally hunted animals and those that were poached—or that South Africa's hunting industry was an important revenue sector. "Penalising an entire industry for the illegal actions of the few is not in the country's best interests," Minister Edna Molewa said in a statement. The Professional Hunters Association of South Africa welcomed the move, saying there was "a clear distinction between illegal wildlife products, such as poached rhino horn or ivory, and legitimate hunting trophies." IFAW estimates the illegal wildlife trade to be worth $19 billion (17 billion euros) a year worldwide.